Who is the #1player you hope will join the 2012 class? Warinner and Hinton are (finally, officially) Buckeyes! Today, Ohio States’ full coaching staff was available for interviews, including the newest members of Coach Meyer’s staff, Ed Warinner and Tim Hinton. These last two, most recently at Notre Dame, have been working with Buckeye recruiting over the past several days, but were only officially introduced and named today- they will also be a part of Coach Meyer’s introduction opportunity at halftime of the Hoosier Basketball game this Saturday. Hinton’s 30 seasons of coaching experience includes 16 seasons in the collegiate ranks with positions at Ohio State, Wilmington, Ohio, Cincinnati and Notre Dame, and 14 years as a head coach at three Ohio high schools: Zane Trace (1987-88); Van Wert (1989) and Harding (1993-2003). Coach Hinton will be working with the Tight Ends and Fullbacks- I’m sure Boren and Stoneburner are more than excited. Warinner, who is 50, has coached at seven different schools: Akron, Michigan State, Army, Air Force, Kansas, Illinois and Notre Dame. In addition to his nine years in coordinator positions, he has spent 15 of the past 20 seasons coaching the offensive line. He has coached on teams that have won four national rushing titles, and earlier this season Rivals.com named Warinner one of the Top 20 “hottest assistant coaches” in the nation. Another Christmas present in Columbus, as yesterday’s staffing press release is followed by today’s announcement that Urban Meyer is indeed following a higher purpose. 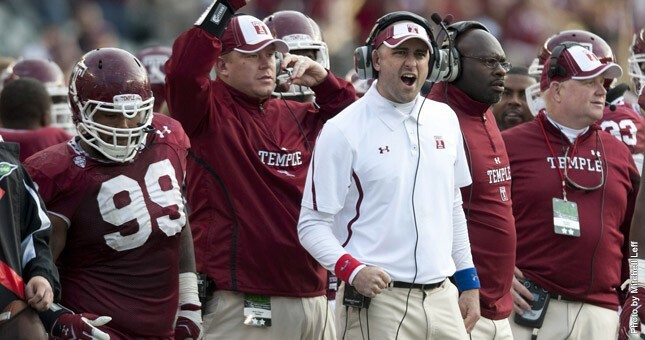 Current Temple Receivers and Special Teams coach, and former Gators coach Zach Smith has been named the latest member of the Ohio State staff. Smith, a Dublin Coffman graduate, is excited to return home after a year at Marshall prior to heading to Temple for the past season. He was a part of the Marshall program that welcomed the football season in at the ‘Shoe in 2010. Zach Smith has already coached with me for five seasons, and so I know what a quality coach he is. He knows my system inside and out and he teaches the system the way I want it to be taught. He has coached and taught some great players already, like Percy Harvin, Aaron Hernandez and Louis Murphy. Zach has done a terrific job as wide receivers coach at both Marshall and this past year at Temple. I am really looking forward to having the opportunity to work with him again. Ohio State is going to benefit from his coaching and his abilities as a recruiter. My coming home has added another element to everything that has gone on this week (ed. Jean Bruce passed away last Friday, right before Temple’s bowl game). My Grandma would be very proud of me. I feel honored to come back and work at this university where both she and my Grandfather’s hearts have always been and I grew up loving. It is really, really a dream come true. I grew up watching Ohio State, my Grandfather coached here and I always dreamt of doing it, too. Plus I have an opportunity to work with Coach Meyer again. I was able to spend five years on his staff at Florida, and now working with him again is another dream come true for me. It’s like two dreams coming true. I’m really excited, and it is wonderful to be back home.